Last in our 2018 game suite is Total War: Warhammer II, built on the same engine of Total War: Warhammer. While there is a more recent Total War title, Total War Saga: Thrones of Britannia, that game was built on the 32-bit version of the engine. The first TW: Warhammer was a DX11 game was to some extent developed with DX12 in mind, with preview builds showcasing DX12 performance. 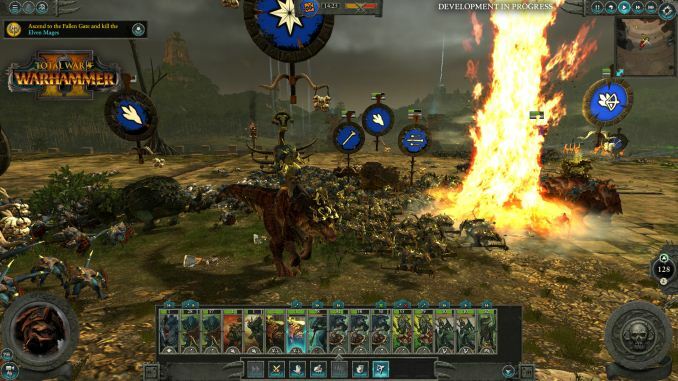 In Warhammer II, the matter, however, appears to have been dropped, with DX12 mode still marked as beta, but also featuring performance regression for both vendors. It's unfortunate because Creative Assembly themselves have acknowledged the CPU-bound nature of their games, and with re-use of game engines as spin-offs, DX12 optimization would have continued to provide benefits, especially if the future of graphics in RTS-type games will lean towards low-level APIs. There are now three benchmarks with varying graphics and processor loads; we've opted for the Battle benchmark, which appears to be the most graphics-bound. At 1080p, the cards quickly run into the CPU bottleneck, which is to be expected with top-tier video cards and the CPU intensive nature of RTS'es. The Founders Edition power and clock tweaks prove less useful here at 4K, but the models are otherwise in keeping with the expected 1-2-3 linup of 2080 Ti, 2080, and 1080 Ti, with the latter two roughly on par and the 2080 Ti pushing further.